Last year I started getting strange pauses in video playback on Youtube when resizing video or putting it in fullscreen and that can get a little annoying, especially when the glitch occurs at an important moment, I haven’t found out why this happens, only that it occurs due to the flash player being set to software rendering mode. 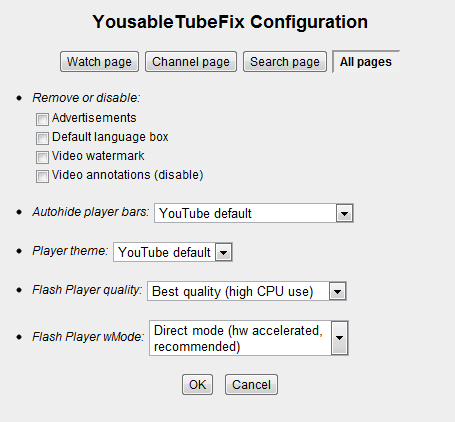 The setting you need to change is the Flash Player wMode under All Pages after clicking the Configure button under any Youtube video and make sure it is set to Direct. Once this is done a playing video should no longer have any pauses when resizing or fullscreening it. To verify that it is indeed working correctly you can right click the video and click ‘Show Video Info’, in the upper left corner of the video a little window should appear stating ‘accelerated video rendering’, if it is still showing software video rendering then it’s either not working or not possible with your hardware. When Google Chrome came out I instantly downloaded and installed it to see what the big deal was. Here is an optimistic look at Google Chrome, past the possible security issues with the browser and the general distrust of Google around the internet at the moment. The performance of Google Chrome is amazing. I didn’t think there would be much improvement in day to day browsing, but the speed increase from using Internet Explorer and Firefox is quite noticable. The other noticable speed increase from these browsers is in the speed that Google Chrome can open and close, on my PC the browser window opens instantly and is able to be used in a few seconds, Firefox depending on what plugins you have install, what theme you are using, at the quickest you normally can’t get it under 3-5 seconds unless you are doing some major tweaking. Google Gears integration also helps on websites that are compatible with it, such as the WordPress Admin section. There were many reports of Google Chrome crashing when It was first released, I never experienced anything like that, in fact I have only ever experienced 1 crash and it appeared to be caused by a specific website that I had never been to before and had no interest in going to again. However, I do experience problems with Google Chrome suddenly losing the ability to produce sound, it happens with YouTube the most often and usually occurs when I have many tabs open. This is not quite a strong side of this browser yet, flash is supported and works great, however Java support is flaky to say the least. Java 1.6 Update 7, the latest stable version of the Java Runtime Environment is not compatible with Google Chrome yet, however Java 1.6 Update 10, currently in Beta is apparently compatible, however I have had no luck with it on my PC, it stops Java applets running in any browser when it is installed, this may be due to a previous (working) installation of Update 10 being removed a few months ago, however I have had no success with the version that worked previously. Other users of Update 10 have also experienced a wide range of problems specific to Google Chrome, so although the latest Beta of the runtime environment is listed as compatible the chances of getting it to run correctly aren’t too good yet. Obviously your favourite FireFox plug-ins are not compatible with Google Chrome Chrome Plugins seems promising in the future and has some good information so far. Theme support appears to be built into Google Chrome but not much has been done in that area yet. As far is website compatibility goes Google Chrome has no major issues, I have rarely come across a website that cannot display properly in this browser. Google Chrome has many features that interest me, the One Unified Box (Address Bar) is very handy, normally I’d have to choose which box was active before I started typing, this was annoying when I started typing somewhere and had to move it to the right area, the lack of recently typed URLs is annoying, but that can be accessed from the New tab page, this lists the most common websites that you have visited and is used to access the history list, the list is set out well and the readability is great. I have not yet used the application shortcuts, but they seem fairly simple to use. The dynamic tabs are fun to use, they allow you to drag a tab out of the window to create a new window with the current tab’s contents. A common feature starting to come out in browsers now is the ability to hide your history, cookies etc for a session, Chrome’s Incognito Mode is very similar to other types of this feature. Google Chrome also warns about malware and phishing websites, I haven’t ran across this yet. The downloads bar is a little annoying and it took a bit of a look through the settings to get it to not forget the folder I last downloaded to. Â The settings importer was automatic at the end of the installation, but can also be invoked from the menu as well, it worked flawlessly for me, cookies and favourites were imported exactly as they were in FireFox. Google Chrome looks and feels very polished, in Vista the glass border is familiar to those that use Internet Explorer, the tabs are in an interesting place, apart from having to remember that they are not in the standard spot I really didn’t notice anything good or bad about them being at the top. The bookmarks are fairly hidden when you first start using Chrome and I had to add the Bookmarks bar so that I remembered how to get to my imported Bookmarks, they are listed under Other Bookmarks and don’t appear to be accessible unless you always show the bookmarks bar. As I stated in the compatability section I have not had many issues with page rendering, also I have not experienced any rendering issues with the browser itself, the UI is smooth and gets familiar fast. As I touched on at the start, this is probably not the browser for you if you are paranoid or have any distrust of Google, also If you don’t have a good virus scanner installed and/or you blindly allow executables to run you may be put off by the possible security flaw regarding launching executables. Google Chrome is a polished browser that is fast and works great, it has no plugins that I am aware of yet and that stops most adopting it as their default browser, but if you’re not worried about that the speed and features certainly helps productivity while browsing. I use Google Chrome for most of my browsing, however if I feel like doing some stumbling or need to use Java I will run FireFox.